On the 23rd November 2017, Dr. Amplianitis presented at 3DCamp. In this talk the Konstantinos Amplianitis presented his team’s research work on dynamic content creation for VR/AR applications developed within the V-SENSE project at Trinity College Dublin. Their technology is able to generate a volumetric hologram of a performance from a set of video sequences recorded by a multi camera setup. The content can then be imported and visualised in different VR/AR devices. The system is quite scalable, works with different camera configurations, outdoor or indoors scenarios and can even generate content from videos captured with handheld consumer quality devices. Konstantinos Amplianitis is a Postdoctoral Research Fellow at Trinity College Dublin and a member of the V-SENSE group. Previously, he was a software engineer at Siemens Mobility and Transportation Group in Berlin, Germany. He obtained his Ph.D. degree in 2016 from the Humboldt University of Berlin in the field of Computer Vision and Machine Learning, focusing on 3D Object Recognition. 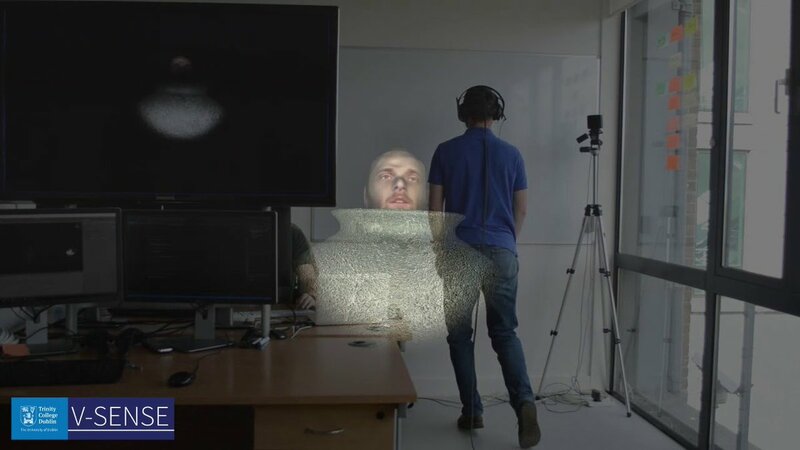 Currently, he is conducting research on segmentation/matting of humans in video sequences using Deep Learning and 3D content creation for VR/AR applications. Jan Ond?ej is Senior Research Fellow at Trinity College Dublin and a member of V-SENSE group. Previously, he was a postdoctoral researcher at Disney Research Los Angeles and Trinity College Dublin. He obtained his Ph.D. in 2011 from INRIA Rennes in France. His current research topics include Free Viewpoint Video and Virtual and Augmented Reality. Other research interests are in Crowd Simulation and Navigation, Human Behaviour Simulation and Character Animation. Ingeniero de Telecomunicación degree (integrated B.Sc. and M.Sc. Accredited by ABET) and the Doctor Ingeniero de Telecomunicación degree (Ph.D. in Communications) from the Universidad Politécnica de Madrid (UPM), Spain, in 2010 and 2016, respectively. Since 2016, he has been member of V-SENSE group at Trinity College Dublin. His research interests include 3D reconstruction, free-viewpoint video, VR/AR, computer vision, and image processing. For more information on the event programme, please inspect here.